Ah, the lure of doing it yourself. I certainly understand it. When it comes to cellular boosters, DIY is definitely the way to go… until it isn’t. When should you get a professional involved? Who needs a cellular booster? Everybody, that’s who. Up to 90% of people experience some sort of weak cell service, every single day. Homeowners are the worst hit. Simply put, homes just aren’t designed for cell signals. You may find that you have plenty of bars outside but practically nothing inside. Or you may find there’s that weird spot in your living room where you get no connection at all. A lot of people use Wi-Fi calling if it’s available from their carrier, and just use the home’s Wi-Fi for data. That’s well and good for you, but what about your friends? What about your relatives? Is Aunt Susie who comes down to visit from Des Moines going to want to get on your Wi-Fi? Do you even want to deal with that? Wi-Fi calling works great and I use it myself, but it’s not a replacement for a cell booster. Simple as that. A lot of businesses have decent cell coverage because a lot of businesses have big windows that let in cell signals the same way they let in light. On the other hand, if you work in a massive cubicle farm you’ll probably find that cell service is a little hard to find. The company Wi-Fi might be limited as well, giving you precious few options when you need to be in contact with the outside world. If you’re at home there are DIY options for almost everyone. In fact, installing a cell booster is one of the easiest upgrades for your home. If you’re able to get up on the roof and put up an outdoor antenna, great! Even if you can’t, there are still window-based options that aren’t quite as good but are a lot better than you’d think. Check out the great selection at Solid Signal. If you have challenges that would stop you from doing the install yourself, or if you just have a lot of money though, cell booster installers will do a great job at home. Even if you have a very large house, you can find cell booster kits that can work for you. However, if you’re looking for customized coverage, a pro will be able to map out the coverage in every room and design a system that works perfectly to give you fantastic coverage. The tools for doing something like this start at a few thousand dollars so it’s not worth it for an average person to have them. The time to use a pro installer is in a multi-story building. Office buildings can be tricky. There’s a lot of random radiation in them owing to all the computers and equipment there. (Most PCs put out very little, but a cube farm with thousands of devices might be a problem.) There are wiring concerns, too. Do you live in a state where special cable is required if you’re going through the suspended ceiling? If you don’t know, you could be in danger of doing it wrong. A lot of times in large buildings, there are several antennas and a master amplifier on each floor, and that takes a lot of planning. If you want great cell service for your large home or business, don’t risk buying the wrong equipment or installing it the wrong way. Take the leap to a professionally designed, professionally installed system. It’s only one call away — get to know the experts at Solid Signal by calling them at 877.312.4547. 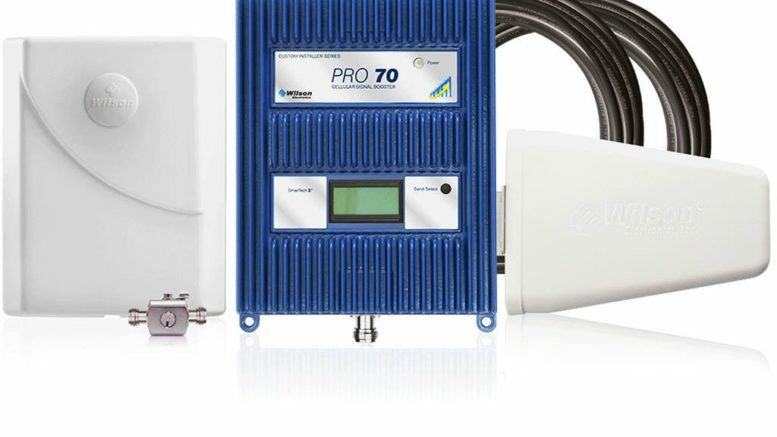 We can design and install a cellular booster system for virtually any need!